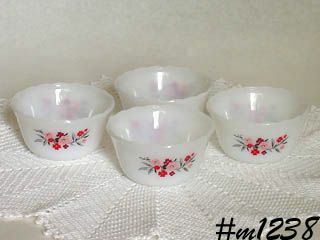 This listing has a set of 4 Fire-King nested bowls! Smallest one measures 4 ¾” diameter, 2 ½” tall. Next one is 6” diameter, 3 1/8” tall. 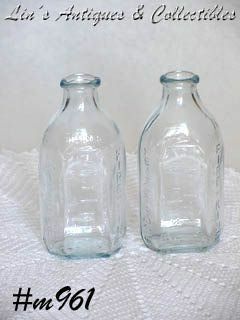 Next is 7 ¼” diameter, 3 ¾” tall and largest one is 8 3/8” diameter, 4 ½” tall. All are in super condition – no dings, cracks, or chips – and all are marked: “Anchor Hocking, Fire-King Ware, Made in U.S.A.” Very nice!! Excellent condition Fire-King bowl with lid! 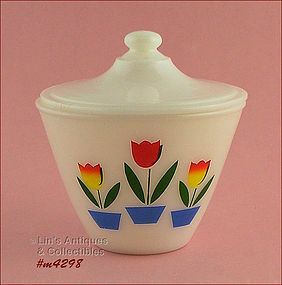 Bowl is white with the pretty and colorful tulips design. This is the small size bowl and is often called a grease jar. 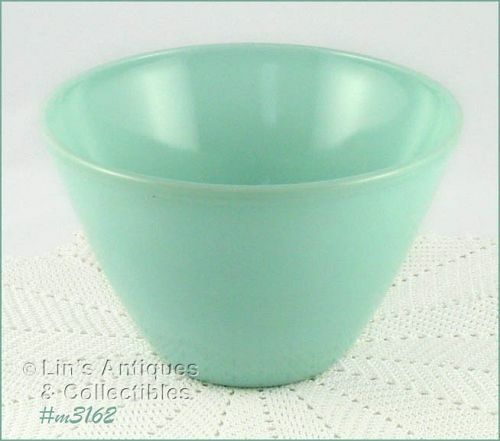 It measures 4 ¼” tall (to rim) and bottom is marked Fire King, Oven Ware, 22, Made in USA. This bowl has been a part of my kitchen collection for many years – I never used it – time to share! 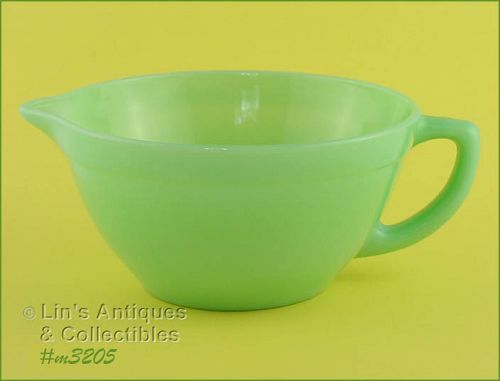 This listing has a pretty Fire-King Jadite (or Jadeite)batter bowl! Marked on bottom: Oven Ware, Fire-King, Made in USA. Pretty color and excellent condition! Really neat Fire-King mixing bowl! This is the larger size from the Chanticleer line. Measures 4 ¾” tall, 10” diameter and is in excellent condition! Mint condition Fire-King custards from the Primrose Line! Set of 4, all marked Fire-King. This listing has a set of 6 Fire-King custards! Although these are custards (and that is their intended use), we use ours as salsa bowls -- they're the perfect size for one serving portion -- just put bowl in center of a saucer and arrange chips around it! 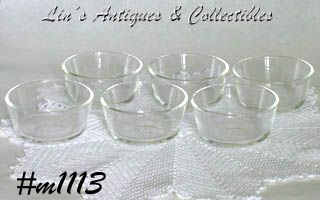 Bowls are clear glass, marked on bottoms: 434, Anchor Hocking, Fire-King, Oven-Proof, Made in U.S.A. All are in mint condition! This listing is for a mint condition Fire-King nurser(baby bottle). This is the 4 ounce size in the sapphire blue color. Excellent collectible and very difficult to find. I have 2 of these available, price is per each. 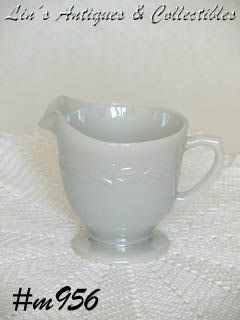 This is a beautiful Fire-King item -- it's a footed creamer in the beautiful and difficult to find Gray Laurel pattern! Creamer is in excellent condition! This listing has another great Fire-King item! It's the 8" square cake pan in the pretty Summer Field pattern! 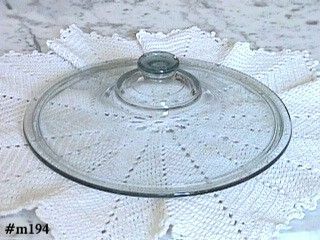 Marked on bottom: 435, Anchor Hocking, Fire-King, Oven Proof, Made in USA, 8" U.S.A.
Cake pan is in in wonderful with a couple small flea bites that are of no consequence to use or to appearance. This is a neat item and is the perfect size for making cakes and brownies from those small size boxes (like Jiffy cake mixes). This is such a pretty Fire King pattern that is becoming ever more collectible. 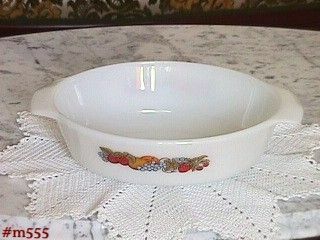 White oval shaped casserole with the Nature's Bounty decal (berries and fruit) on both sides of the bowl. 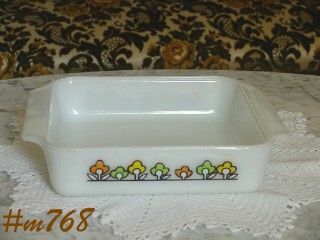 Marked on bottom: 433, Anchor Hocking, Fire King, Oven-proof, Made in U.S.A., 1 1/2 Qt, USA. Casserole is in excellent condition. This listing has a set of 2 beautiful Fire-King French casseroles! Both are white with hand painted fruits -- one has green grapes, the other has purple grapes. Both are absolutely mint condition -- they look new! This listing has a beautiful Fire-King lid! It measures 8" diameter and has a knob type handle. Marked Fire King. Very nice! 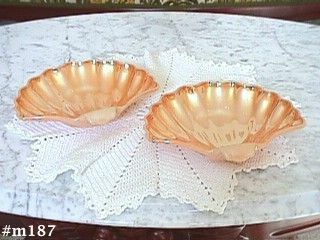 This listing has a set of 2 unmarked Fire-King candy dishes that are shaped like half clam shells! They measure 6" x 7", are in the pretty Lustre finish, and are in excellent condition! While these dishes are actually kitchen items, they would be lovely in a guest bathroom filled with pretty soaps, bath oil beads, or potpourri! 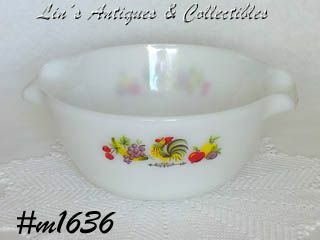 There are lovely Fire King dinnerware items in this listing! These are the Primrose pattern and there are 4 plates and 4 saucers. The plates measure 9 1/8" diameter and the saucers measure 5 3/4". They are marked on bottom: Oven Ware, Fire-King, Made in USA. All are in excellent condition!